In a week when the news is full of terrible storms, I found myself reading this book in preparation for work on a future novel. The deadliest tornado (by far) in American history, this tornado killed at least 695 people as it raced through Missouri, Illinois, and Indiana for more than 200 miles, the longest tornado in history. My family moved to Annapolis, Missouri, the first town destroyed by the Tri-State Tornado, in 1965, and at that time, forty years after the event, there were people around who had lived through it. I particularly remember hearing the story of the tornado from Mr. Vincent Sutton, a kindly gentleman who went to our church and had served as the mayor of the town for many years. His memory was of how fast the tornado arrived, and how little time anyone had to act. In an era of satellite weather forecasting and instant telecommunication, it’s hard to recall what a tornado would have been like in 1925. This book (which, by the way, is written by a meteorologist and probably best appreciated by fellow meteorology fanatics) describes the arrival of the storm to the many towns it devastated. People going about their ordinary business, children at school, workers on the job, families at home; occasionally a sense of unease at the size of the gathering clouds; then the storm’s unimaginably swift onslaught. Imagine an F5 tornado appearing over the horizon, traveling at seventy miles an hour, a path of devastation more than a mile wide, and no word of warning or sirens, because such a system had not yet been invented. No wonder the people who lived through this storm talked about it in tones of awe. I think of Emerson’s famous comment about individuality: “A foolish consistency is the hobgoblin of little minds, adored by little statesmen and philosophers and divines. With consistency a great soul has simply nothing to do.” The adjective that often gets overlooked there is the “foolish” before the “consistency.” It’s not consistency itself that is the problem, it’s foolish consistency, following the dictates of convention without knowing why or having good reason. It’s fine to scorn the herd, but sometimes the herd is heading for the waterhole. Conventional wisdom is sometimes conventional because it’s wise. It seems like the older I get, the more the idea of the wisdom of the elders makes sense to me. What the elders have to offer is accumulated practical experience, the knowledge of what works and what doesn’t. The word “orthodox” originally meant “correct thinking.” Rejecting the conventional sometimes means rejecting common sense, substituting what you would like to be true for what is true. My “unorthodox ideas” may just be whims. Emerson writes in “Self-Reliance,” “I would write on the lintels of the door-post, Whim,” but I would not recommend using whim to build your porch. The entire talk will be up on their website before long. or so says Javert in the musical version of Les Misérables. I had the pleasure of seeing that show at the Quincy (Ill.) Community Theatre last weekend, and for various reasons, that line stuck with me more than it had in previous performances. Before I go on about that passage, let me gush for a moment about the QCT’s production. Quincy is a town of 40,000, with a community theater that relies on all-volunteer casts (although this production brought in a professional singer to play Jean Valjean). Yet despite those limitations, the QCT brought in a version of Les Misérables that was remarkably robust and accomplished. I give the music director, Larry Finley, a lot of credit for coordinating a tight 20-person pit orchestra with the singers. The performance was a real triumph for a small-city community theater group and a fitting 400th production in its history. But back to Javert. He speaks that line when he is sending Fantine on her path to ruin, and of course we are meant to recognize it as the heartless abstraction that it is. It’s a way for Javert to not-think about the human being in front of him, casting her as an example of a principle rather than a person with particular circumstances. We all know people like that; I work with some of them, and there are few more frustrating sorts to deal with than those who insist on an inflexible abstraction in the face of compelling circumstances before them. What struck me about the line this time, though, was not merely that it shows the limitations of Javert’s spirit, but that it’s so palpably false. Some of my dearest people live for their honest work – devote themselves to it – and receive no reward at all. We’ve all known people who have seen their honest and devoted work get snatched away by workplace politics and the selfishness of others. So what’s a person to do? There’s no good answer. Persist in your work and ignore the reward or lack of reward that may come from it? Nice idea but it feels like surrendering to those who choose to play the game instead of focusing on their proper work. Play the game yourself? That’s abandoning your principles. Dealing with our fellow human beings is a messy business, and only the Javerts of this world make it tidy in their own minds with comforting, fake abstractions. And who wants to be a Javert? This is blackberry-picking time — in my youth, the trip was always down to Sinking Creek, where wild blackberries grew in abundance in the river bottom. Then in later years, I have great memories of Rod Walton taking us to his secret blackberry-picking place, an old farm owned by a friend. The edges of all the fields were overgrown with blackberry vines about three feet tall, and we had to push through briars every step of the way — but the berries were great! After a while, it was hard to tell which smears on our hands were berry stains and which ones were bloodstains, but hey, it all washed off eventually. Some nice photos, courtesy of my daughter, of some recent appearances. 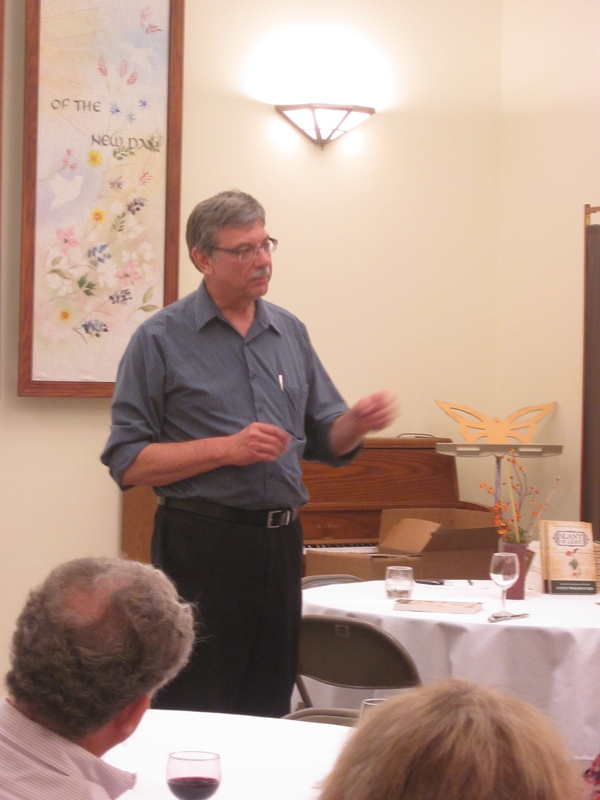 Talking about utopias at the Quincy Unitarian Church. 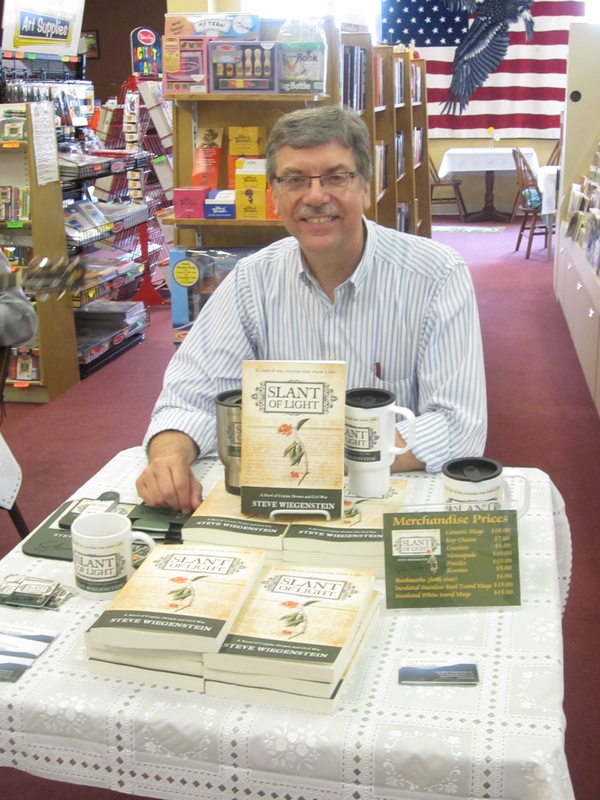 Signing at Great Debate Booksin Quincy. 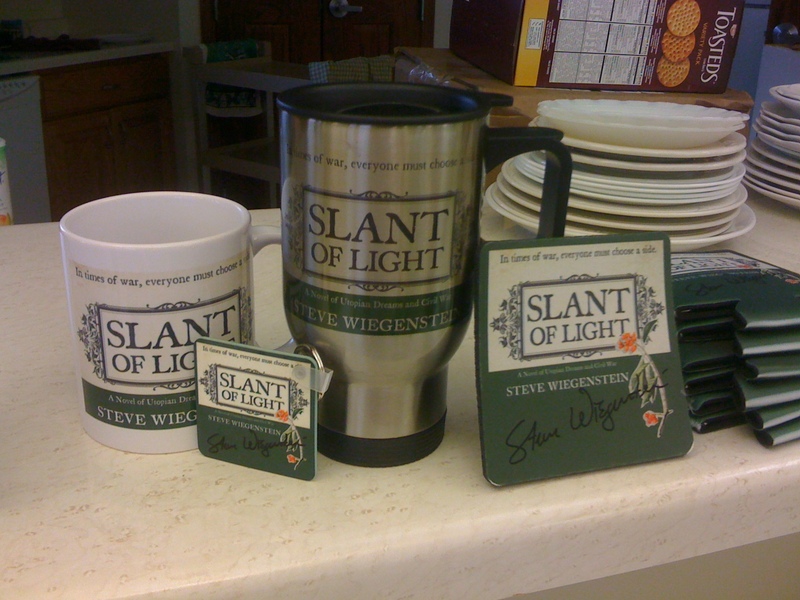 The super-cool merchandise that Expressions by Christine in Quincy came up with to help me promote my book! Authors, take note…..they do wonderful work! This weekend I’ll be doing readings/signings at the Quincy Unitarian Church on Friday evening and at Great Debate Books on Saturday afternoon. Although I am not living in Quincy now, I still consider it “home” and still love to visit the church–in fact, I’ve never transferred my membership out of it, despite my departure. When the folks at the church heard that my book was coming out, they immediately wanted to put on a celebration–so that’s what this will be! Wine and cheese and hors d’oeuvres, with a brief reading and lots of happy conversations. Then for those who prefer Saturdays, a signing in a more traditional location: Great Debate Books, an independent bookstore at the corner of Sixth and Maine. Looking forward to both events! The St. Louis Post-Dispatch has a nice review of Slant of Light this morning, published with perfect timing for the launch on Thursday. It’s interesting to me how different reviewers focus on different elements of the book. Harry Levins is known for his intense interest in history, so that’s what gets attention here.